HUPC Chemical Co., Ltd. specialized in providing management services of supply chain for many different industries like Ink, Paint, Coating, Pigment Paste and Plastic, etc. It’s located in the garden city of China----Hangzhou City of which has a very developed ocean and air freight ability, the World No. 1 and No.6th CTN Port, i.e. Shanghai Port and Ningbo Port is very close. 400KM around HUPC is the most active economic zone-------Yangzi River Delta Economic Circle, here has a forest of factories, together with the complete and perfect facilities, providing almost whole range of the raw materials and the assistant materials which will be used in coating and plastic industries. HUPC Chemical Co., Ltd has its own factory and warehouse, and dozens of long-term cooperated factories. The product quality is stable and the delivery is in time. An advanced laboratory equipment can provide a professional physical & chemical performance testing and application testing to pigments, resin and other products. We keep a very strict consistency with our customers in testing instruments, methods, and the materials. Its own container incasement warehouse near Shanghai and Ningbo Port can provide a very convenience service for unifying the goods from different factories, unified encasement, customs declaration, and one-off delivery will help our customers to save order time and lotistics cost for Import. 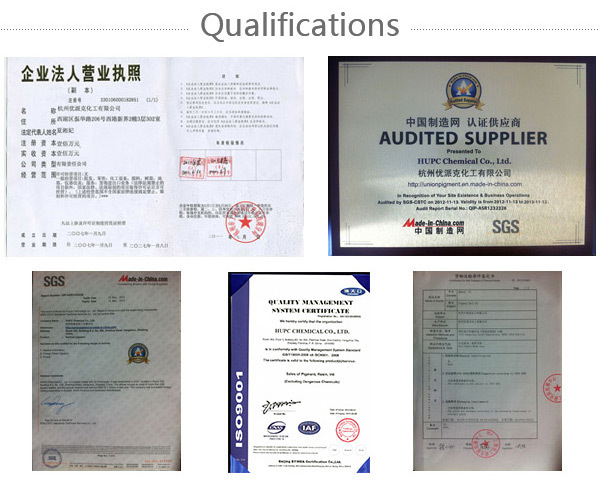 We, HUPC Chemical Co., Ltd has a long-term cooperation with many excellent Shipping Companies, different delivery terms are accepted, such as: DDP, DDU, CIP, CPT, CIF, CNF, and FOB, etc. Our powerful fund strength can provide an incomparable financial services to our customers, meet their requirements of trade financing, our customers can avoide the situation of being enforced to accept different payment terms from different suppliers.